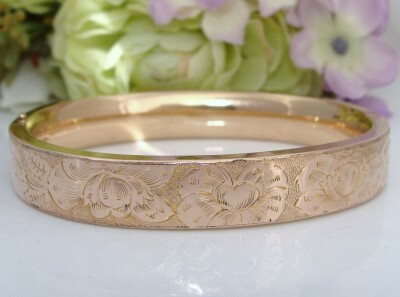 What an Absolutely Stunning bangle from a highly renowned maker! It is larger in size than most and the hand-tooled design is truly gorgeous. The top is features stylized Cabbage Roses – the Ambassadors of Love – and foliage, all delicately detailed. The pictures will best provide the description - just Magnificent! It really is Exquisite with the superb craftsmanship unlike any see today. The back and interior is totally plain and smooth. It is an elongated square-oval shape so it can be worn comfortably as a cuff bangle. Its “hidden hinge” is functioning as new & the clasp opens to reveal an internal sliding bar as a security feature – it snaps closed securely! The gold has a soft, rose/pink hue with yellow highlights and the colour in the pictures is true-to-life. It has that silky smooth feel usually only associated with solid carat gold which is to be expected of quality antique jewellery. Trademark: F.M. Co for Finberg Manufacturing Company, established in 1888 and renowned for their high-end, superior quality pieces including bangles, bracelets and lockets. Better-than-Excellent Antique condition! Apart from a minimum of typical surface scratching, I cannot fault it - it would have been worn a handful of times at the most. There is no wear, damage, flaws or dents – the gold is Absolutely Pristine! It is just perfect for gift giving and is certainly one to be kept for “special” as it is gorgeous and a very rare find! You will be absolutely thrilled with this purchase destined to become a treasured Family Heirloom.